Just a Peak…..It’s my gear list! Hold the phone. 2 updates in 3 days?!! Praise the heavens it’s a miracle! 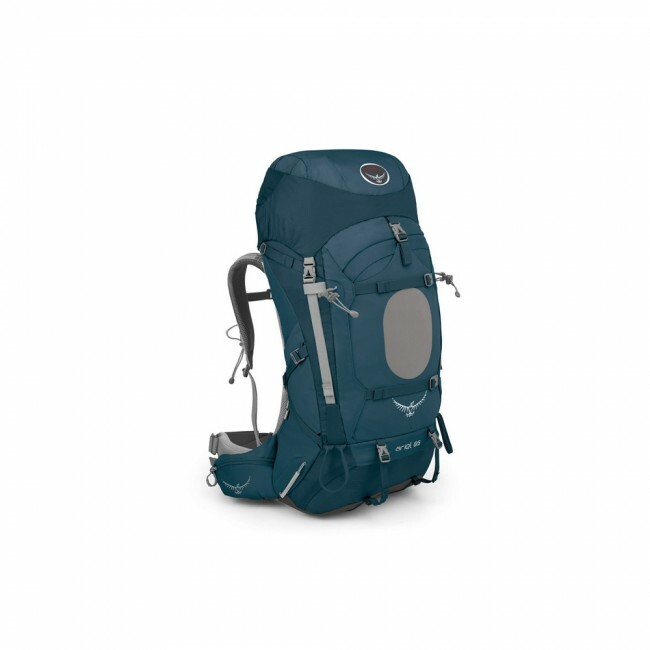 After millions of hours of researching and comparing gear, scouring forums and blogs, sending too many annoying emails, going through my own only -certified-for-Camp- Unie gear, and a little DIYing I am finally ready to reveal to the world what I will be bringing with me on my hike! WARNING: This post might bring out my inner newbie gear nerd and does not contain much humor. Sorry I’m not sorry. But if for some reason you are interested in what I am bringing and my opinions on them, then keep reading! Camp Unie 4 Lyfe. The place that inspired me to travel the trail on the loose. Love this backpack! It was a birthday gift from my parents (before they knew of any plans to hike the AT. The pack that started it all. You can blame them 🙂 ) and I absolutely love it! It’s roomy but comfy (so far! We’ll see my thoughts once I actually hike some mountains. The side compartments are a little small and oddly shaped and it’ll be interesting to keep fitting my platypus H2O bottles in there, but otherwise everything else seems very durable. It has a capacity of 65L and weighs 4lbs 15oz. A little heavier but it’ll also be sturdy and reliable and I like that. 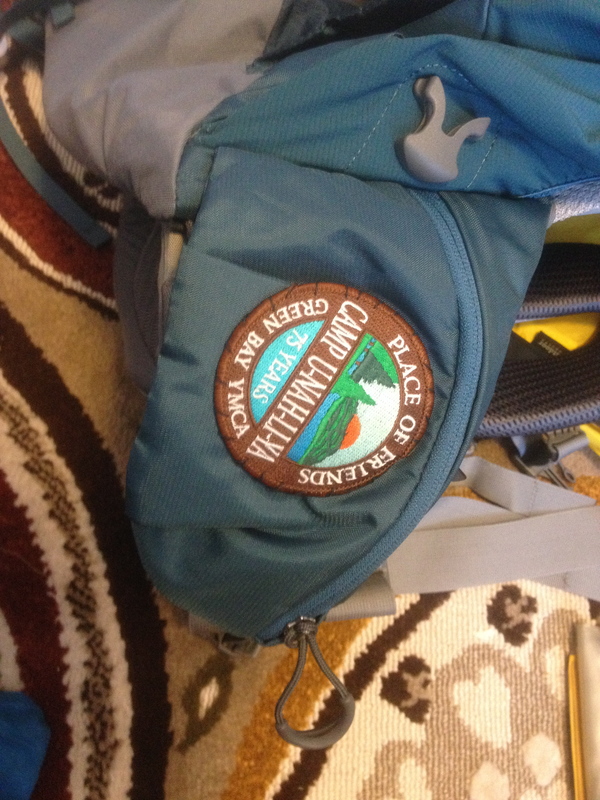 I even pimped it out with a Camp Unie patch. I love my hammock! I have had it for almost 3 years and it is purrfect. The doublenest is ultra roomy. I can wrap myself in a cocoon and also stash some gear around me too. I just get way better sleep in a hammock and I love being able to put it where tents can’t go. I’ve also got a set of Hennessy Snake Skins. 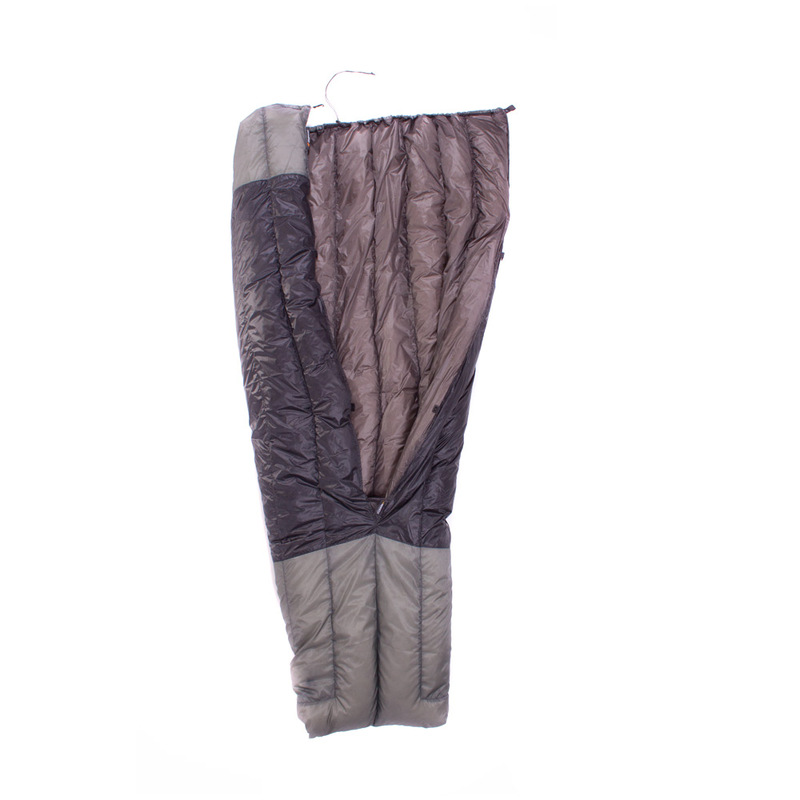 They are like an insta stuff sack for your hammock and prevent it from ever touching the ground. I’ve heard wonders and so far they are pretty cool! I’ve also had the ENO BugNet for 2 years and for not having to worry about weight and at the time still learning the basics of hammocks (and I’m still learning! ), it is a great bug net! 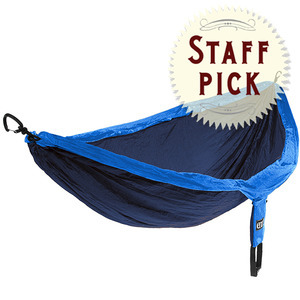 It fully encloses you and your hammock all around. And it’s removable for when you don’t need it. However. I always put it on (not for fear of bugs but just because it I felt more comfortable) and it can be a tiny bit time-consuming, the ropes don’t always reach where you want them to, it’s heavy, and it doesn’t pack down very well. I wanted a hammock that had a bug net on top all the time. I felt it would be more efficient. 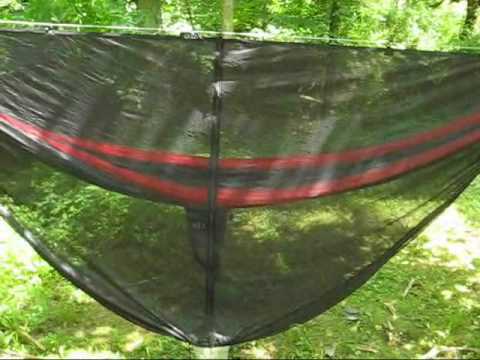 However, I did not want to spend a ton of money and buy a new hammock with the bugnet. I found some guidelines on how to make your own bugnet. But then I procrastinated and couldn’t get the materials in time. Panic. But then: Lightbulb! I had a perfectly good bugnet already. I googled until my fingers fell off hoping someone had tried this before. Nothing. So I performed surgery. 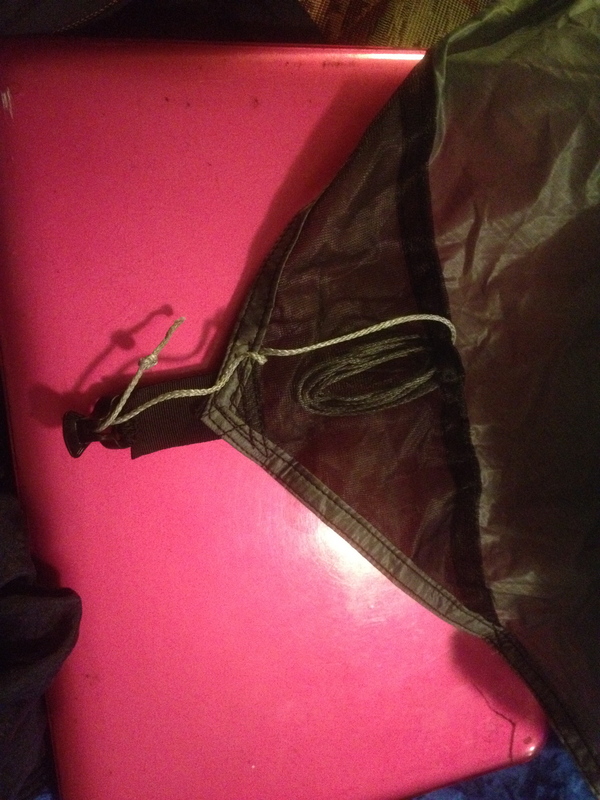 I removed the bugnet zipper and attached it to my hammock. Cut up the bug net, and eventually sewed it on the top of the hammock. Sounds easy. Took me forever. But it worked! I shaved off a ton of weight. 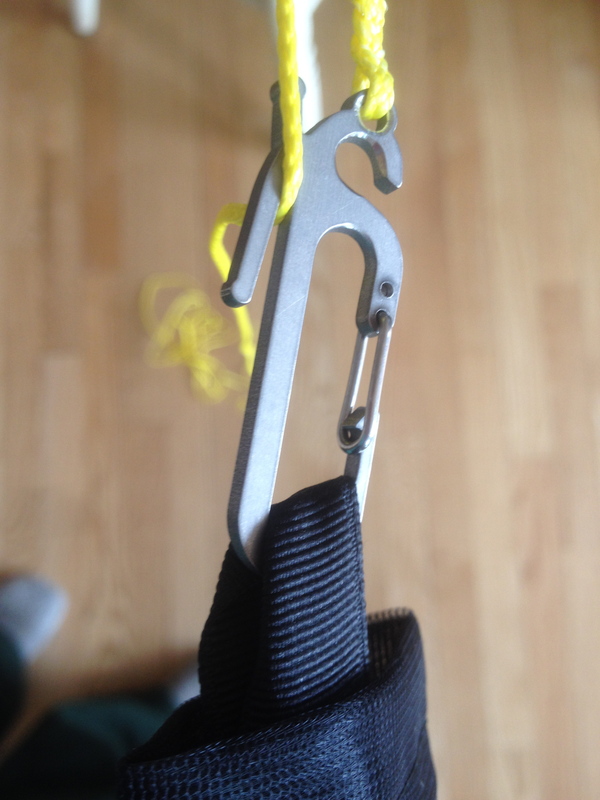 I also got a whoopie sling ridge line to keep the sag in my hammock while also keeping the net off of myself. It’s a miracle! I’m so proud. Fingers crossed it stays together more than 2 days. Post Op. 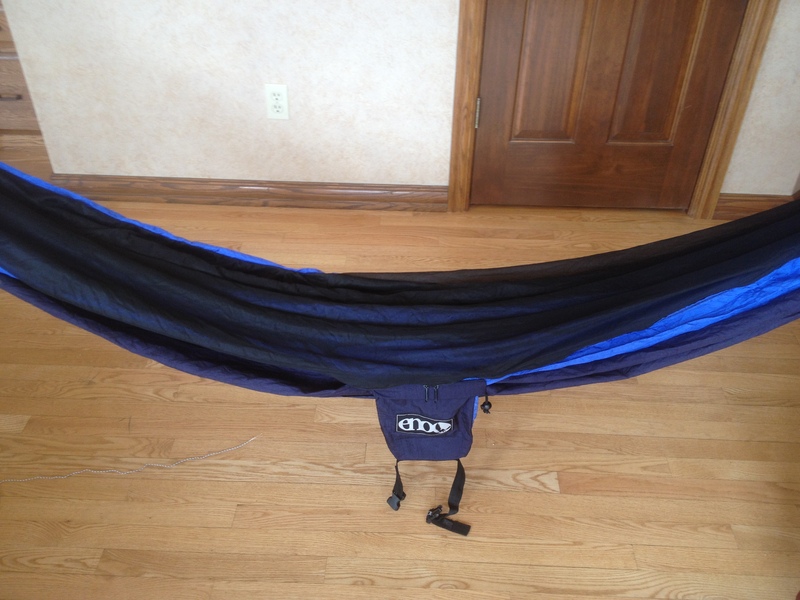 Hammock with Bugnet sewn on top. This is also before I installed the ridgeline. The suspension of the gods. I also realized that my hammock’s suspension (what you use to hang your hammock up) was wayyyy heavier than it needed. I also strongly disliked ENO’s smart straps. They were the first straps to come out and ENO has since greatly improved there straps. 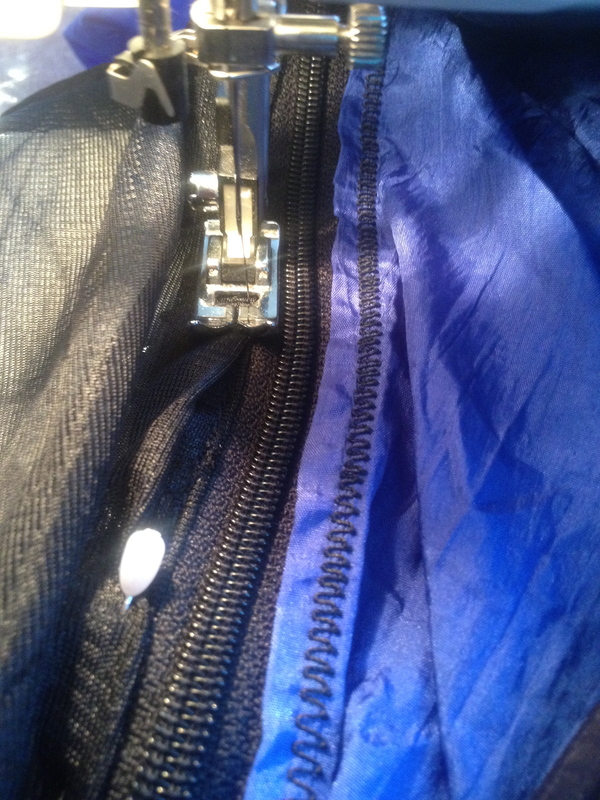 However the ones I have the loops are too spaced out and it takes awhile to get the right fit. Again they are also heavy. And the ropes and biners that were in my hammock were unnecessarily heavy as well. Then I found Dutch. What an incredibly helpful guy! A master hammocker and genius. 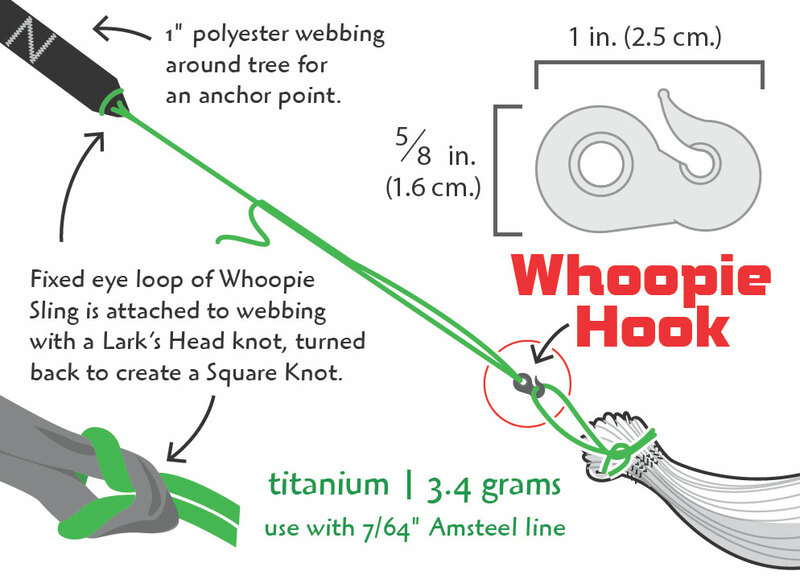 I upgraded to some beautiful whoopie slings with a dutch hook, and lighter, shorter, webbing with a dutch clip. Installed a continuous loop in replace of the heavy rope and biners. Saved crazy amounts of weight and cut my set up time by minutes! Tadpole with cordpockets and the linelocs I sewed on. Used lash it for the tie outs. I know you are sick of me saying this. I also had an ENO DryFly as a tarp. This is new and I used it a lot last summer. Yes it keeps me dry. However, with its six guy lines plus having to set it up over the bug net there were about 80 million ropes going every which way. Also while researching gear I realized it was really heavy, and it is (22oz). So I needed to find a tarp that was lightweight, big enough to cook under, but not too big where it seems like I’m living in Noahs Arc, pack small, and most importantly not expensive. Oh boy. 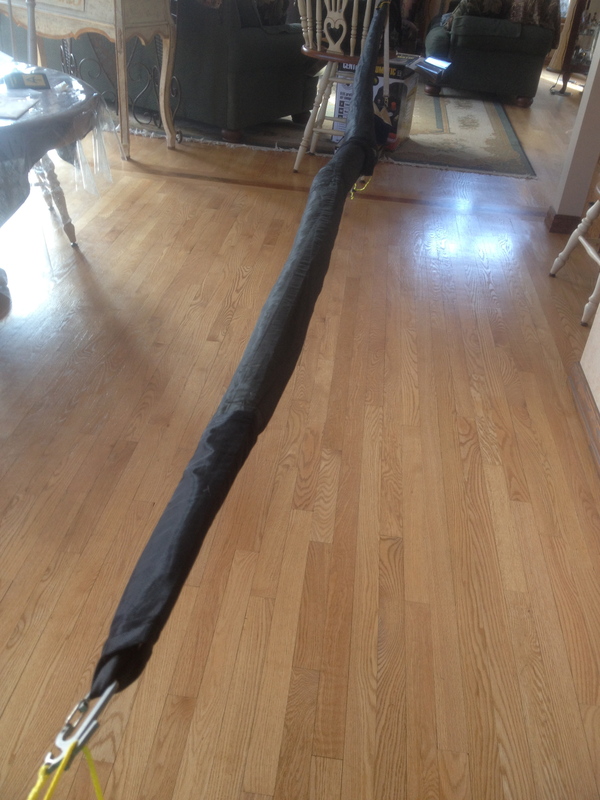 Lightweight tarps made from cuben fiber, sil nylon, ARE CRAZY EXPENSIVE. I was looking anywhere between $167-$300. Hell no. But then! I found the Tad pole! Shout out to Marty from Wilderness Logics (great company in NC) who answered my questions. At only 11.5oz and 132”x92” FOR ONLY $90!! Amazing! And then you can customize it to fit your needs, add on cord pockets, doors, pullouts, tri-loops. I absolutely love this tarp! I sewed on lineloc 3s to each webbing loop for my lines and got some Dutch Stingerz for my Ridgeline (love them too!). I also got some sweet mesh tarp sleeves to store my tarp in, make set up even easier, and allow my tarp to dry a little even when stored away. 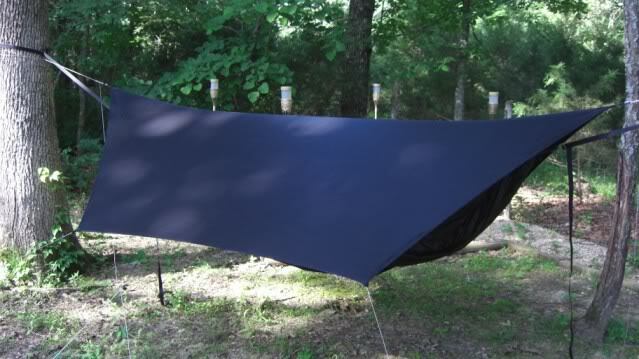 It’s also nice that you can set up your tarp in the sleeves above your hammock, but take off the sleeves when you want your tarp open. Katharina is the women who makes them in this cozy cottage in the Santa Cruz Mountains, and she is the best! Derek from the Ultimate Hang also deserves a huge shout out! He gave me the stepping-stones, tools, and pro advice on how to create the ultimate hammock using what I already have, DIY, and inexpensive alternatives. I’ve always used a sleeping pad in my hammock but I wanted an upgrade (Plus when sleep in shelters I can had a nice pad to sleep on) Something lighter than what I had a ton times warmers. The Xtherm is just that! It’s 15oz but made to be a winter sleeping pad. It has two layers of triangular baffles to create a ton insulating cells, which slows convective heat loss.Hammocks sleep cold and I want to make sure I keep warm on the AT. This paired with my quilt I think I will be just fine. Just like the reviews said, it is loud and crinkly (albeit less noisy than the XLite). I am used to a durable thicker material and the XTherm does seem a lot more fragile. I don’t feel quite comfortable carrying this on the outside of my pack, but maybe if I find a good bag or something to wrap it in I can keep it on the outside. I realized I needed a new sleeping bag when 0* bag left my freezing in Isle Royale temps of 20s and low 30s. Upon researching I discovered the joys of quilts! No zipper, no hood and open on the bottom. The rating of your sleeping bag or quilt doesn’t matter when you lay on top of it. Your weight pushes down the insulation and it essentially becomes non existent. Which is why hammocks are colder. You have air blowing under you rather than ground that helps insulate you. So with the help of a sleeping pad under you (or a under quilt under your hammock) you can stay just as warm with a quilt. I am really nervous about being cold so I knew a down quilt would be the best. 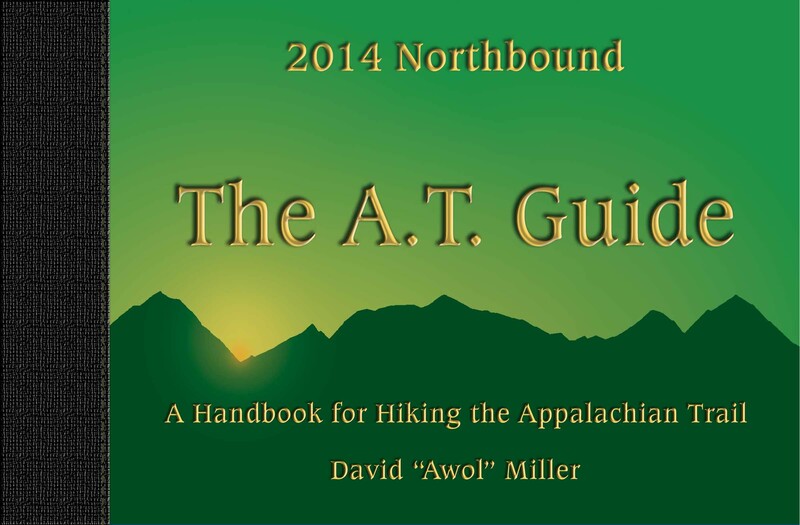 But there is lots of rain on the AT and down and water are not best buddies. Then I heard about a great company in Winona, MN called Enlightened Equipment. All bags are custom-made to your size and needs. The Enigma 850DT is perfect. It has DownTek treated down that is resistant to moisture. The bottom is also completely sewn up around the feet and to the catfish area to help keep your dogs nice and toasty. 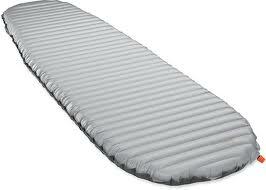 It comes with straps to attach to your sleeping pad if you want. This bag is so warm and perfect! I haven’t stopped sleeping in it since I got it. And Tim Marshall was so friendly and super helpful! He whipped this puppy out in under a week! This combined with my Sea to Summit silk liner and my Xtherm, I think I will be nice and warm! These babies are 15.9 oz and I got an amazing price for them on Steep and Cheap. Seriously I saved buckets. If you want to save buckets on your gear, Steep and Cheap is the way to go. I have never used hiking poles before, so I know that I am bound to look ridiculous when I start, but once I figure out how to use them I am sure they will be great. Also when I got them I had no idea they were purple and greenish. Super cute. That’s what hiking’s all about right? Also the inside of the straps are like this furry fleece. They make your hands feel like princesses. I’ve decided to hike with a trail runner because I had heard they are better in the long run for your feet. They are more breathable than hiking boots, a little more flexible, dry faster, and might not give you quite as many blisters. They also run a bit large so I went with a size 8.5. 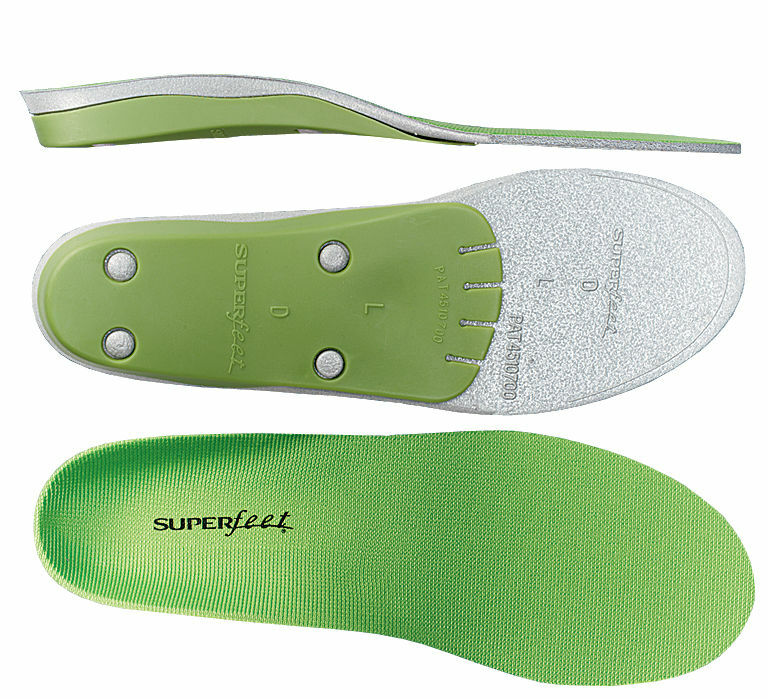 I also invested in a pari of Superfeet insoles (Green) so help protect my joints a little more and hopefully ease up on my knees a little. They provide mad support and feel really sturdy under my feet. I need to break them in more as they can be slippery on rocks, but I feel pretty confident they will last awhile. I also have an amazing pair of Merrel hiking boots that I recently started thinking about hiking in initially while it is still cold and sending my Salmons when it warms up. I am still deciding on that. My only experience with camp stoves is those and Camp U-Nah-Li-Ya. I’ve grown used to them, love them and have learned their parts and how to repair them. I am used to having to work and wait for your water to boil, and I love it! However, I decided that since I think that I will mostly be boiling water anyways rather than cooking 20 pancakes and a cauldron full of nugget of gold, I wanted something that could do it fast. And boy does the Jetboil deliver! Boils water in under 2 minutes, stores inside of itself, weighs 10.5oz, and if when I am tired of having ramen everyday, there is the option to get a pot support and jetboil pan that work with the stove. It is so user-friendly, it’s almost scary. It actually is scary though, your turn the fuel on, hit the igniter switch and BOOM! Almost Insta-Boil! 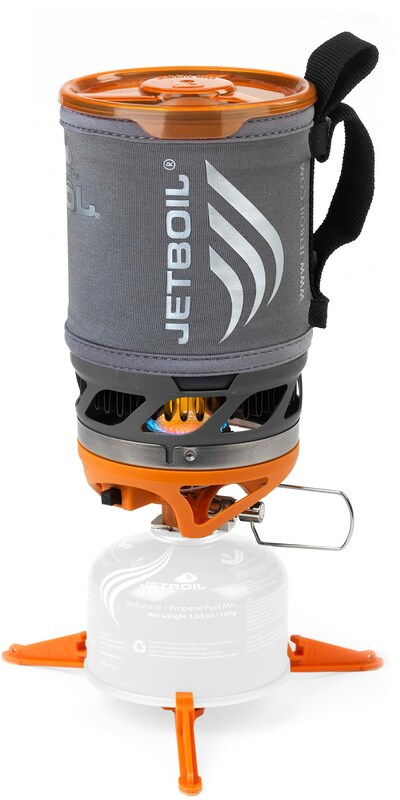 Its great!It’s capacity is 0.8L and has a quaint insulating cozy and handle attached to it. Bring on the ramen! 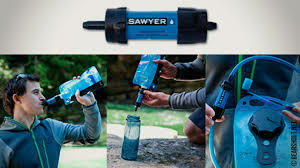 I was recommended this water filter by a great friend of mine, unbeknownst to the all of the amazing reviews of this little guy! Simply fill up your water bottle, screw the filter on top, and drink from it! It weighs a tiny 2 oz and is good for 100,000 gallons, filters %99.9999 of bacteria and protozoa. It also comes with a straw and the pump to clean it. So far it’s been working great and I’m excited to use it on trail. I also am bringing 2 1L Platypus water bottles. They are collapsable and can stow away if empty. I will also bring the bottom half of a plastic water bottle to fill up the platypus in the times where there is a weak water flow. I am not bringing a hydration bladder, I have a feeling I will end up getting one but I am going to try without for right now. This is what is going to allow my mom to sleep at night! This nifty gadget sends my GPS location every 10 minutes and also allows me to send 2 custom messages to check in with my folks. It alerts them via email (also texts, but you have to have a national carrier for them to receive them) which is pretty sweet. There is also an SOS button that I can use in a life or death situation. 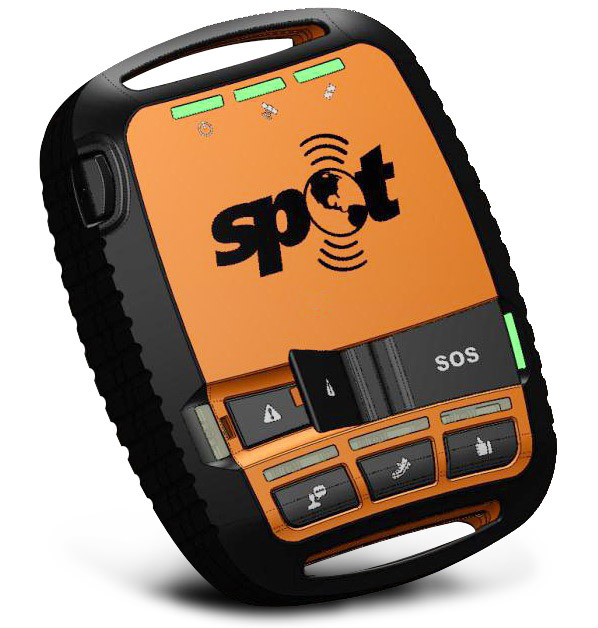 When I push SOS, it alerts the emergency services and hundred off helicopters come rescue me! Or something like that. But for real, it’s pretty neat and allows my parents to look to go to a website and check my path and location to make sure I’m alive. Yay! 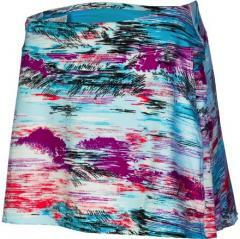 These down jacker was another amazing steal on steep in cheap. I think I got over %52 percent off. I am not a fan of the color, it kind of makes me feel like a leprechaun or shamrock shake, but it is nice and toasty. Found on Steep and Cheap, super comfy! Has pretty long sleeve, but I like that. Very warm and soft. Also has a extra large hood that is meant to go over helmets and such. I think it’ll be great going over the messy buns on top of my head. It’s perfect! Steep and Cheap. Meant for cold weather. Merino wool. Boom. I also have a pair of of reebok leggings that I already own and a pair of Gramicci Native Art that I think are kind of retro, so I will also bring one of those. Icebreaker is also a pretty awesome company! They value the sheep and employees of their company and you can even trace your specific piece of clothing to the original farm! It’s pretty neat. Found on Steep and Cheap (can you tell lived there?). 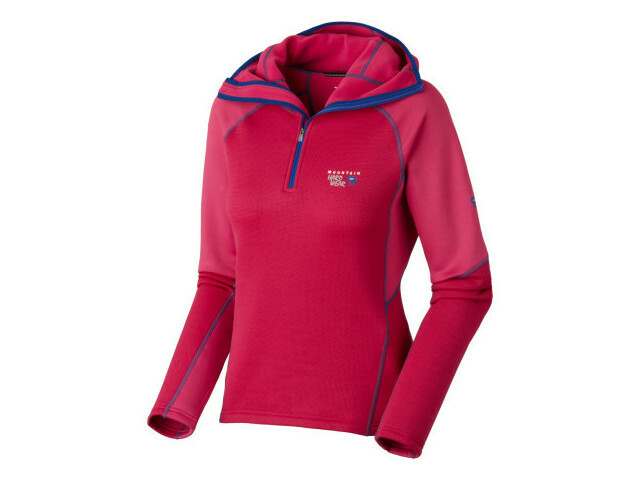 Merino wool, nice and warm and comfy. Steep and Cheap. 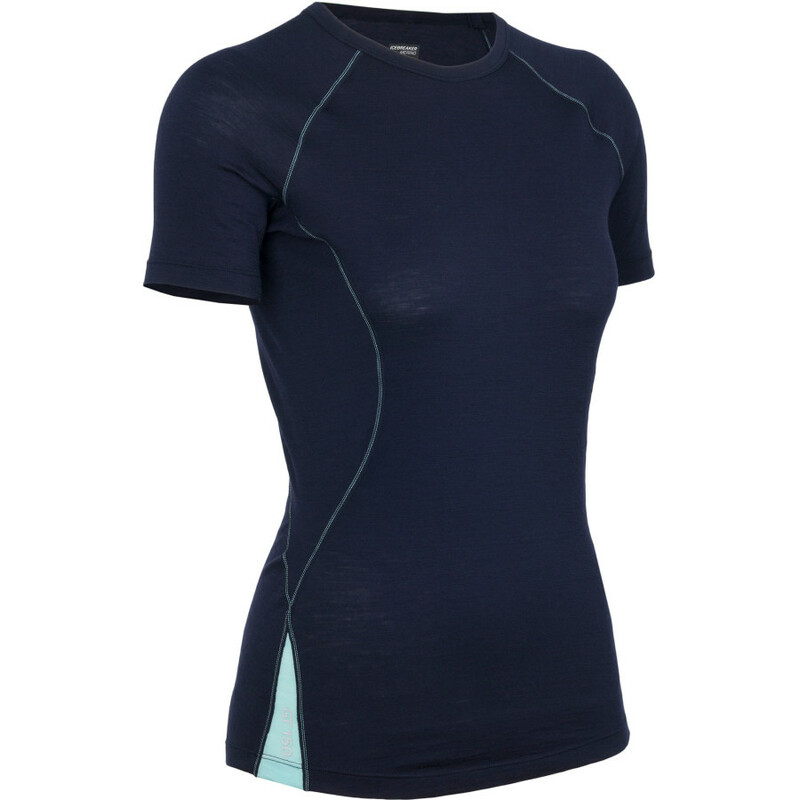 Tighter fitting, but still pretty comfy and made our of merino wool. I also have 2 other nike dri fit shirts that I already have. I will bring 2 t shirts to start and then swap one out for a new one when they get tired of hiking. I like this shirt because it’ll keep me warm when it’s cool outside but then will also wick moisture and sweat away when it is warm outside. Versitile. I like it. Found on Steep and Cheap. Seriously the most comfortable thing I have ever worn. Has built in shorts that don’t slide around and prevent chaffing, great coverage, and it was at a price I couldn’t pass up. Not sure how I feel about the color though, kinda…you know. But when it warms up I will try this out and see how it goes! Read amazing reviews about these socks! 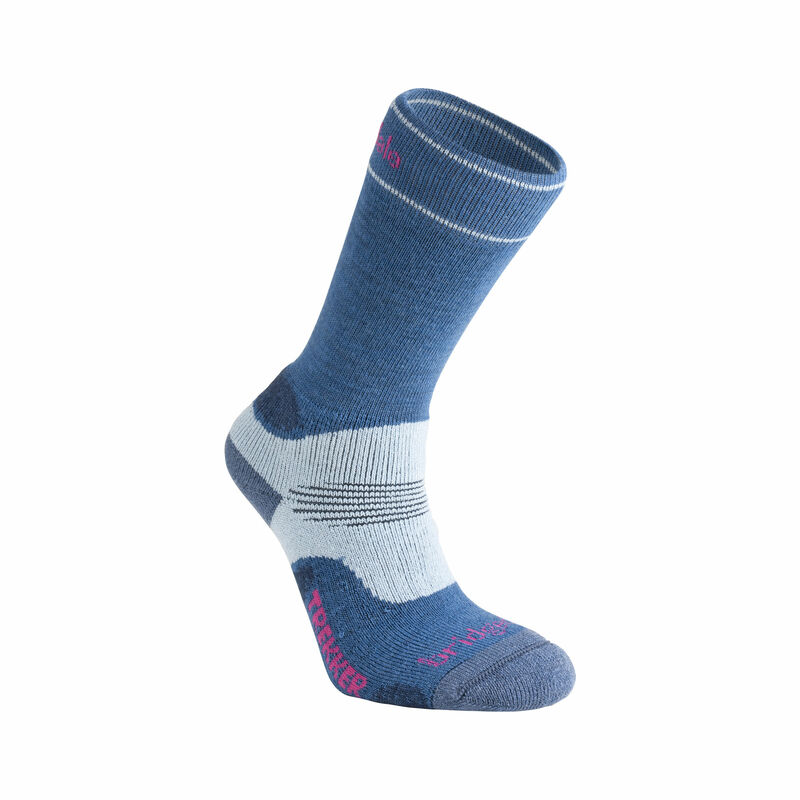 Think Smartwool but more awesome! Plus they are made in the UK so they make me feel exotic. Amazing costumer service too, they helped me pick out the perfect pair. 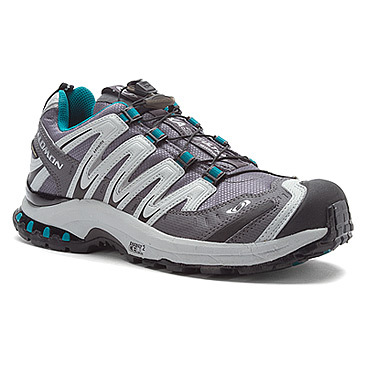 I went with a midweight and they feel great in and out of my hiking shoes. Founds these babies on Steep and Cheap as well. Ultra comfy and made from merino wool. I had read that the seams get twisted when you wash them, so I just stitched a couple of X’s in various places to keep the band in place. I will bring 2 pair and will have a 3rd sent at some point to swap out. 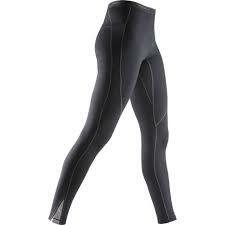 They are seamless and are just overall comfy. And dat merino wool doe! So great. I am bringing 7 days of food to star with. I also have 7 mail drops planned for along the trail. I organized everything in ziplocs and then put breakfast, lunch, dinner, and snacks, in a gallon ziploc just to keep a little order in the food bag. 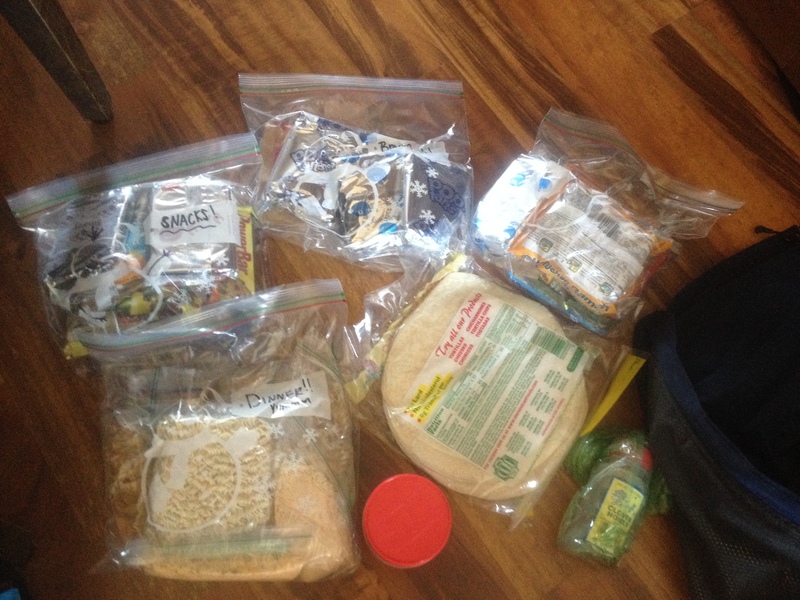 Lots of instant pasta, rice, couscous, and power bars. I am also making homemade granola that will have lots and lots on good nutrients in it and be super delicious. My initial food bag weighs (without the granola yet) a little over 11 pounds. I don’t need anything else as long as I have this! Tell me milage, elevation, nearest shelters, towns, what’s in the towns, places to stay, resupply, etc. Fabulous! Other items I have: 2 sportsbras, my tevas for camp shoes, rain jacket (heavier one for now and then I’ll switch to a lighter one. I’ve had both for a few years) rain pants, lighter, spork, journal, a book, headlamp, phone, ear plugs, knife, first aid kit, sewing kit, rope, duct tape, toilet paper, toothbrush and toothpaste, Dr. Bronners soap, maybe a camera, hat, gloves, sunglasses, baseball cap, and I think that’s all! Thank you so much for reading! Feel free to comment on anything, give advice, ask a question, etc! It’s appreciated! This entry was posted in Appalachian Trail, Gear List, Thru-Hiking and tagged Appalachian Trail, AWOLs Guidbook, Black Diamond Trekking Poles, Bridgedale WoolFusion Trekker Socks, bugnet, Dutch clip, Dutch hook, Dutchware, Enigma 850DT, EnLightened Equipment, Food, Gear list, Hammock, IceBreaker, Icebreaker BodyFit 200 Oasis Crew Long-Sleeve, Icebreaker BodyFit Plus 200 Pace Leggings, Icebreaker Bolt Crew Top, Insulation, JetBoil Sol, Merino Wool, Mountain Goat Hats and Goods, Mountain Hardwear Solidus Pullover Fleece Jacket, Osprey, Osprey Ariel 65, Patagonia Ultralight Down Jacket, Platypus Water Bottle, Quilt, Ridgeline, Salomon, Salomon XA Pro 3D Ulta 2 GTX Trail Runners, Sawyer Mini Water Filter, Sports Gym Girl Ultra Skirt, SPOT Satellite Messenger, Stingerz, Stoic, Stoic Merino 200 Boy Boxers, Superfeet Green, Suspension, Tadpole, Tarp, Therm-a-rest NeoAir XTherm, Thru-hiking, Ultimate Hang, Whoopie Sling, Wilderness Logics. Bookmark the permalink. Bring some fun and silly things. You won’t regret it. Haha That’s such a great idea! 🙂 will do! Thank you so much!